Many believed [their 2003 breakup] was the end for Carissa’s Wierd, but last year, the band got back together for a one-off reunion show in Seattle, and last month, they released a new single entitled Tucson. 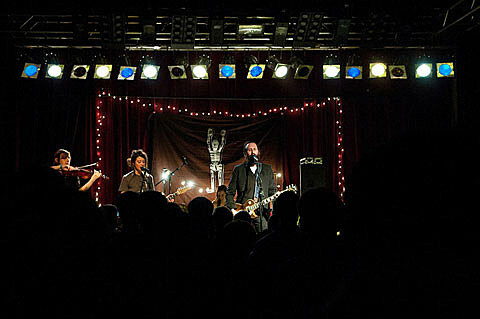 Now the band [played] their first non-Seattle gig in more than 8 years at Kimmel’s E&L Auditorium this [past] Monday. For a very small group of people, this show is the equivalent of Godspeed You! Black Emperor’s five-day stand in NYC last spring. To round out the bill, Cobb booked Kayo Dot and Arms & Sleepers. “I think they both bring interesting things to the show. Kayo Dot, similarly to Carissa’s Wierd has a really strong underground following. Not a lot of people know their name, but those who know them tend to love them,” she explained. How was last night’s Carissa’s Wierd show? S plays Bruar Falls tonight (10/11).